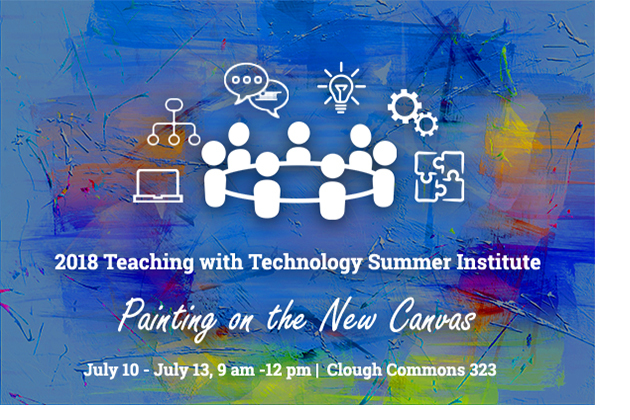 The Center for Teaching and Learning (CTL) invites Georgia Tech faculty members to participate in its 2018 Teaching with Technology Summer Institute on the theme of “Painting on the New Canvas”. The four-day institute (July 10-13, 2018) will explore a pedagogical approach to the integration of technologies into curriculum to support effective teaching and enhance student learning. During the institute, faculty will have an opportunity to work with learning technology specialists from CTL, as well as peers across disciplines, to investigate ways of leveraging the potential of Canvas, Georgia Tech’s new learning management system. The institute will consist of a mix of small-group and large-group sessions, as well as individual work time, facilitated by the learning technology specialists from CTL. Participants will engage in discussions and hands-on workshop activities to learn how to best utilize various tools in Canvas to build a course that will facilitate active learning, collaborative learning, and effective assessment (see the summer institute schedule below for more details). How does it differ from Canvas training? Please note that this program is uniquely different from, and not a substitute for, the Canvas training offered by the Office of Information Technology (OIT). 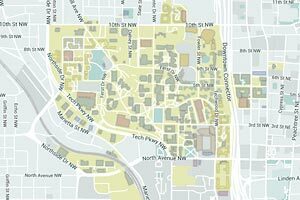 If you intend to learn how to use the tools in Canvas, we recommend you consider attending the Canvas training sessions (see http://canvas.gatech.edu/canvas-training-options for details) prior to attending the institute. The institute is focused on enabling faculty to build a course in Canvas by creating interactive course content, engaging course activities, and effective assessments that align with their specific course goals and objectives. No matter whether you are a novice or an expert in using Canvas, please come and join us to leverage this opportunity of rethinking about how you teach with technology and getting your course ready in Canvas for Fall 2018! Presenting and organizing course content with a sensible navigation, as well as a logical, meaningful structure, helps students quickly find content they need and also provides effective guidance to their learning. In this session, we will explore the relationships among various tools in Canvas, such as Syllabus, Files, Pages, Modules, and Media Gallery, and how to integrate them to present and organize course content in different modalities to maximize learning opportunities. Building an engaging learning environment requires continuous and effective interaction between instructors and students, and among students themselves. Technologies make it easier for instructors and students to communicate and interact in and outside of class. In this session, we will explore how to use different tools in Canvas, such as emails, announcements, discussion forum, web conferencing, and group workspace, to facilitate effective communication and design collaborative learning activities. Using a range of methods for assessment helps students measure their learning progress, knowledge, and skills against learning outcomes. It also enables instructors to respond to identified learning needs and strengths by modifying their teaching approach as necessary. In this session, we will explore techniques and best practices of conducting assessment by utilizing such tools and features as Assignments, Quizzes, Speedgrader, Peer Review, Rubric, and Outcomes. This session will give you the opportunity to work one-on-one with professionals from CTL and OIT to wrap up your course development in Canvas. We will help you address any questions you may have but were not addressed during the past three sessions. If continuous development is needed, we will set up an action plan to collaborate with you after the summer institute.